BMW enthusiasts are always impressed with the level of dedication we have, not just to the cars, but to our tools, work space, and specialist equipment. Nothing at Bimmertech is second best. Our work area is specially designed for the job, no stone was left unturned, and the results we produce from the garage speak for themselves. Our workshop tools, are trusted, state-of-the art and BMW specific, to ensure the best repair from you BMW. As your specific model BMW is unique and special, we ensure we have all the specialist tools and knowledge to complete the job quickly and efficiently. Most other companies who have this specialist diagnostic equipment are larger, official BMW companies; because we are small and cater almost exclusively to the Northern Beaches, we can provide you with the fastest response times, and focus personally on the work you want done. Our workshop is equipped with everything needed to carry out simple repair maintenance jobs as well as more complex operations and specialist vehicle services. You’ll be looked after by one of our staff members, who will make sure you and your car are well looked after. We have large service spaces, and can cater for up to 12 vehicles at a time. All over the world, BMW service locations are using the latest technology and IT systems in a diagnostic role for your BMW. This allows our staff to identify the problem your BMW is experiencing with unparalleled speed and absolute accuracy. Your vehicle itself comes with an on-board diagnostic system that provides us with a full history of any faults the internal electrical system has experienced, which ensures that we quickly and easily can gain information about necessary internal repairs. This information allow precise analysis of the problem, so we can make the best plan for repairs. Here at Bimmertech only BMW approved diagnostic scan devices are used on your car. When you come to collect your car we will provide you with a complete Vehicle Scan and report, no matter what the service or repair, so you are just as aware of what has happened as we are. 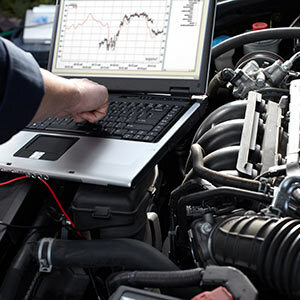 One of our specialised tools is the mobile diagnosis testers, a highly useful tool that connects with your cars wireless system and delivers all the vital data and information from your vehicle to us. We can then locate and research information for the necessary repairs and parts needed from an electronic catalogue, saving us time and you money. Bimmertech does not only have the most advanced technology, as seen in our specialist tools and equipment – we also employ only the most highly qualified employees, with high seniority and experience. At Bimmertech we only use only genuine BMW or BMW recommended spare parts on your car. This ensures the best fit and function for your BMW. By only offering genuine parts, we maintain the quality and reliability of repairs. When you come to pick up your BMW we will explain to you everything that has been done to your car in a clear, simple and understandable way. If anything extra needs to be done beyond what was discussed with us initially, we will always give you a call to talk through the changes in your repair or services, and to get your approval. We believe that keeping you involved in the work done on your vehicle is important, and a simple call is no trouble on our part. We encourage you to discuss any issues with our qualified team in the workshop. If you want to make a booking, talk to us about repair and service options for your prestigious BMW or to ask more about our equipment, tools and team, give us a call today on (02) 9948 1310 to talk to one of our knowledgeable and friendly staff.